Source: Barta, M. (2018). In planta bioassay on the effects of endophytic Beauveria strains against larvae of horse-chestnut leaf miner (Cameraria ohridella). Biological Control, 121, 88-98. When plants are attacked by the insects, it becomes essential for us to try finding a way to get rid of them. In order to do so we tend to use chemicals , which, besides affecting the harmful insects might also harm the other living organisms. Under such situations, biological agents could be used as pesticides and replace the chemical agents. One such example is the use of fungi as the agents for killing bugs. Such fungi are called entomopathogenic fungi and tend to grow inside the insects for some time. Entomopathogenic fungi usually cause internal damage to the insect by producing toxic compounds. There are a number of factors that would decide how effective the fungi would be in killing the insect pest. I have been fascinated about such fungal pesticides that are used against many insects and the name of Beauveria is a common one among these biopesticides. The fungus Beauveria is most commonly found in the soil of almost all kinds- from forest soils to desert soils. Beauveria has the potential to either halt the development of the insect or even causing death of the insect. Scientists across different countries have worked in trying to understand the biology, the environment, the role of this particular fungi in controlling the harmful insects. Keeping its potential in mind, scientists have tried to study its role in killing a moth, which mines through and damages the leaves of the Horse-Chestnut trees. 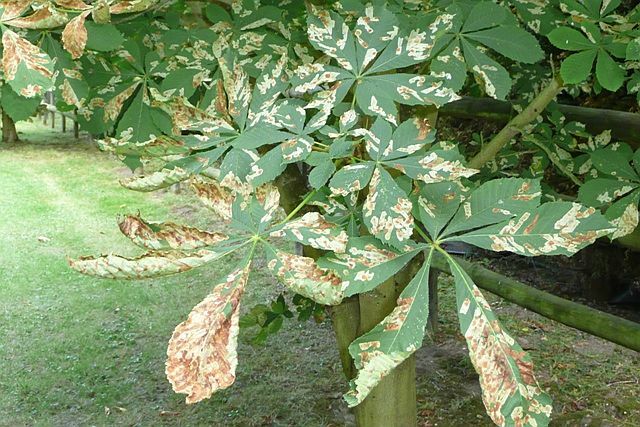 This leaf miner has invaded many parts of Europe and caused serious threat to the horse-chestnut trees by stripping the trees off their leaves. Can the fungus Beauveria save the horse-chestnut tree? The researchers performed a number of experiments to understand the role of Beauveria fungi in stopping the leaf miner of horse-chestnut trees. For this, they used the fungi from two different locations-one from the tree itself and another from the soil. They wanted to know if these particular fungi could act against the leaf miners and if so in what dosage? They found that the fungi Beauveria were effective in killing the leaf miner, both directly and indirectly. The researchers also tried to artificially grow the fungi in the leaves of horse-chestnut trees and were successful to grow them inside the leaves. This work was a first of its kind to document the impact of Beauveria on the leaf miner moth. In order to reach up to the expectation of sustainable farming, we can say that the fungus Beauveria represents a good biopesticide candidate. Even when not intimately associated with a plant this fungus can still establish itself inside the plant. The researchers are also of the opinion that in order to broaden its role as a biopesticide, further studies on its establishment on non-host plants, the suitable technology etc. are needed. More details about Beauveria can be found here.